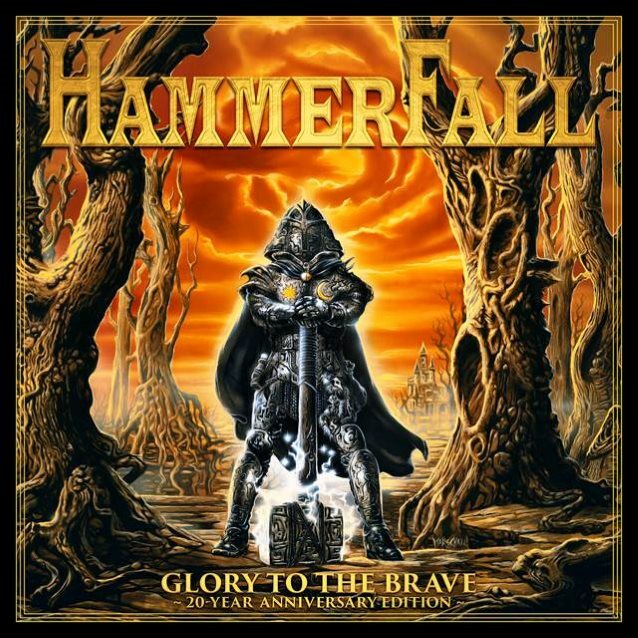 A video trailer for HAMMERFALL‘s upcoming “Glory To The Brave – 20 Year Anniversary Edition” can be seen below. The gold and black vinyl, as well as the digital version of the album, will be released on December 1 — with the extensive fan box set dropping on December 15. When HAMMERFALL released its debut album, “Glory To The Brave”, twenty years ago, the five Swedes launched a true heavy metal revival overnight. While the mainstream still concentrated on grunge and the metal scene was dominated by especially black and gothic acts, this traditional metal record was like a godsend and heralded a new era. “For us, the immense success was a real shock in the beginning,” singer Joacim Cans remembers, because suddenly, HAMMERFALL were considered to be the saviors of true metal. They received countless rave reviews from magazines, Wacken Open Air booked the band at prime time on the main stage, Kai Hansen invited the band personally to join as support on the GAMMA RAY tour and the CD entered the German album chart at the amazing position of No. 38 — an unbelievable achievement during this time. “Our advantage was that no one has expected us and our album. We only did what we wanted and felt compelled to do,” Cans says. This passion was not least influenced by German metal acts like ACCEPT, HELLOWEEN and STORMWITCH but also by other underdogs like WARLORD and PICTURE. “I’m still very proud of this album; it has turned our lives upside down,” the vocalist sums up, and is equally proud of the extensive re-release of the cult album. The re-release includes the completely remastered version of “Glory To The Brave”, a radio edit of the legendary title track as well as the great cover version of the STORMWITCH classic “Ravenlord”. The bonus CD will include six live versions of “The Metal Age”, “Steel Meets Steel”, “Stone Cold”, “Glory To The Brave”, “Hammerfall” and “The Dragon Lies Bleeding”, as well as a medley from numerous tracks off of their first-class debut album, which was recorded live this year at a show in Berlin. In addition to this, the double CD will also be enhanced by a bonus DVD containing the first chapters of their “The First Crusade” documentary, which was originally published on VHS, as well as four new, historically edited interview chapters plus a live recording of their Dynamo Open Air show at Eindhoven in 1998. It will be available as a digipak in an attractive box set, including a booklet containing detailed liner notes, many photos from the private archives of the musicians as well as magazine reports, flyers, posters and much more. Besides the 2-CD/DVD, you can also purchase the audio part separately, which includes bonus tracks as a double-vinyl in various colors. “Glory To The Brave – 20 Year Anniversary Edition” will be released with brand-new cover artwork and is now available for pre-order.